If you look around, you can't help but see the signs around the world of shifts occurring. Whether it is shootings, bombings, or a democratic vote for change, many people feel a need to cry out and make their voices heard – to change the world around them, and to change it now. Amidst this apparent turmoil, it's easy to feel lost, scared, sad, or angry. I wanted to find the words to help you through whatever you are experiencing – something that could help you feel more stable or feel like your voice was being heard. I spent a lot of time reflecting on what could help you the best. As I looked within me for answers, two words came – Mother Teresa. It was an unexpected answer because I never paid much attention to the deeds or teachings of Mother Teresa. Sure, I knew of the years she spent helping people in India. I had heard of the movement to make her a saint. I researched Mother Teresa to find out why her name was the answer I was given for how to help you with the turmoil in the world today. 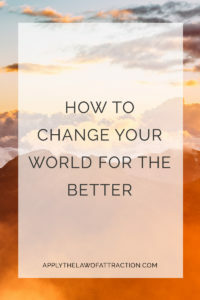 In my searching, I found nuggets of gold that show how to find peace and safety in current events, how to heal the world, how to have your voice heard, and how to be the change you wish to see in the world. You see, Mother Teresa understood that if you want to change the world, you have to lead by example. If you want to live in a peaceful world, the peace begins with you. It isn't about praying for wars or violence to end. It's about praying for peace, finding that peace within yourself, and sharing it with others. She knew that the best way to create a more loving and safe world was by showing that same love and kindness to others. It might be something as simple as a smile. It might be something as benign as a kind look. It's about seeing and knowing that we are all connected. We aren't living separate lives where nothing we do affects no one else. No matter how big this world is, not matter how far we are spread, we are a community. We are never alone. Mother Teresa understood that focusing on the problems wouldn't change anything, nor would waiting for others to create the change for us. Instead, we must be the source of that change, and it begins in the present moment by finding peace, love, kindness, and joy within ourselves, so that we can then share with those around us. Like a stone thrown in a lake, the peace, love, kindness, and joy will ripple out to everyone – near and far alike. Mother Teresa truly said it better than I ever could, so I will allow her to do so with these quotes. I truly hope they help you, no matter what you may facing, at any point in your life.